This product is a light non-greasy liquid spray with the uplifting aroma of lemongrass. This exclusive formula is designed to ease combing, detangle and add light moisture to hair daily. Fortified with tea tree oil, it disinfects skin, scalp and hair. Spray onto scalp and hair to dissolve dandruff. 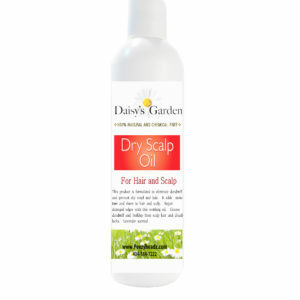 Use with Daisy’s Garden Hair Oil as a pre-shampoo and to cleanse starter locs and loc residue. 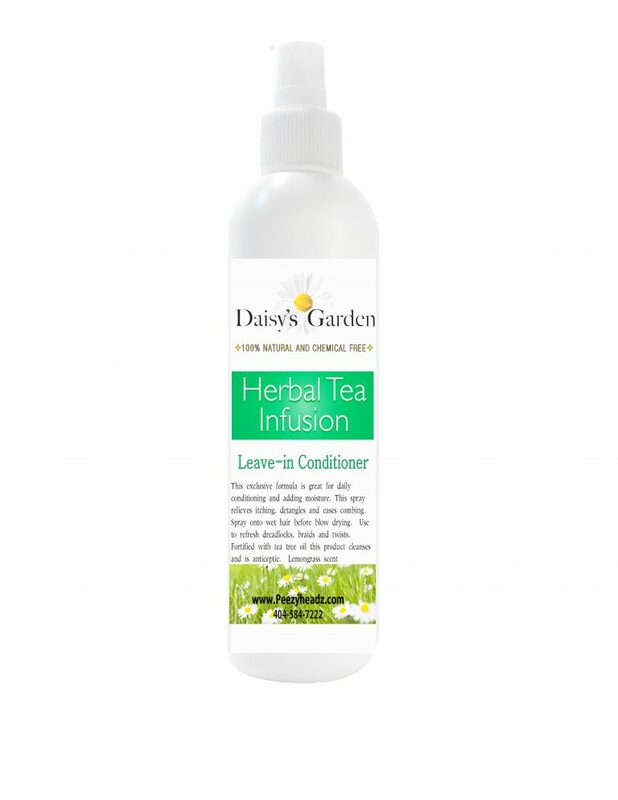 Herbal Tea Infusion conditions hair, eases combing and braid removal leaving hair healthy and tangle free. Our antiseptic recipe relieves scalp itching and absorbs odors trapped in locs and braids. 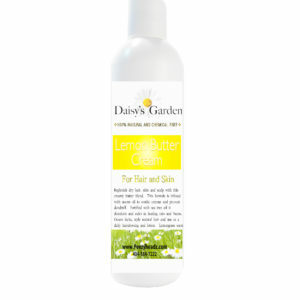 Use with Daisy’s Garden Lemon Butter Cream for loc and all twisting, braiding and adding extensions. This product is a soothing olive oil based oil with a relaxing lavender aroma. This formula adds moisture and sheen to hair and scalp. Repair damaged hair and reverse most hair thinning with daily use of this rejuvenating scalp dressing. Cleanse dandruff from the scalp and hair by using as a pre-shampoo. Our signature oil removes residue and buildup from locs and start up locs. Use to prevent dandruff from recurring, detangle hair and ease braid removal. Use to moisten, soften and shine locs, twists, braids, and extensions or as a finisher. Best when used with Daisy’s Garden Herbal Tea Infusion. This product has a creamy texture and the uplifting aroma of lemongrass. Replenish dry hair, scalp and skin with this formula. Apply to dry feet and dermatitis. Pure neem seed oil rejuvenates with daily use. Fortified with tea tree oil, it kills germs, impurities and helps to heal broken skin, cuts and burns. Energizing lemongrass lifts the spirit and repels insects. Lemon Butter Cream is great for grooming beards. Pamper your hair by using with Daisy’s Garden Herbal Tea Infusion for loc and all twisting, braiding, adding extensions and hair styling needs.